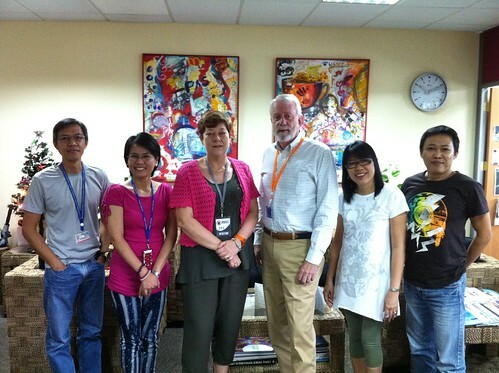 In September I was delighted to travel to Manila and run a 2-day EARCOS supported workshop called 'Digital Dimensions' at the Brent International School, Manila in the Philippines. 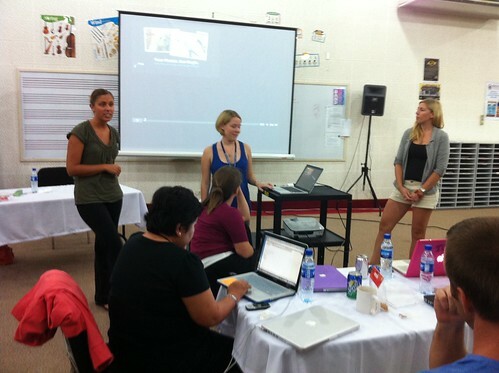 This was my first trip to Manila, and my first opportunity to learn more about schools and education in the Philippines. As part of the trip I also visited the EARCOS office, based on the Brent campus and met most of the staff. I also spent some time with Rina Bautusta (President) and Edric and Doris from the Knowledge Channel Foundation based in Manila. This was an enlightening time as I learned about the TV shows the KC create and disseminate, and how many communities throughout the Philippines are not connected or have very little access to the Internet therefore television remains a major means of multimedia content for education. We talked a lot how to improve learning and access to digital resources in underprivileged communities. Teachers across the country are wanting to learn new methods but often lack support and facility to implement these. There is no easy answer, and real change will only come when infrastructure across the country is improved, however I do feel there is a lot that can be done to change pedagogical approach even before full or regular access to online tools is available. Rina also provided an opportunity for me to speak with other educators and also representatives from other organisations AND the Filipino Education Department at The Beacon School, which is a Filipino Community IB World School led by Principal Mary Chua. This was an excellent session and I spoke about Flat Classroom as well as ISTE and the support this global organisation can provide to teachers, as well as 21st Century learning. 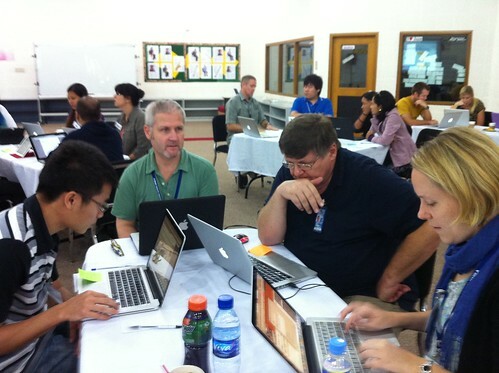 The Digital Dimensions Workshop was held over 2 days with about 35 teachers, mostly from Brent IS. What will your digital journey be like this year? Let's kick-start the adventure now in this hands-on, project-based, collaborative workshop. Explore exciting Web 2.0 tools (like blogs, wikis, podcasts, Twitter, digital storytelling, and social bookmarking). In addition, explore digital media to support learning and formative as well as authentic assessment across the curriculum. An essential element of the workshop is to work together in a constructivist learning environment, and by using global collaboration tools, work on a tangible product(s) that can be used immediately in the classroom. This workshop is designed to open doors to new modes of teaching and learning and focus on the learner (teacher and student) as a communicator, collaborator and creator. Participants gathered onto the Learning Confluence Ning to form an online learning community, and also joined the wiki to contribute their ideas and build their team project. It is important to gather people together during a workshop and provide an online learning environment for them to interact and share ideas. This environment is temporary and transient, it is not meant to sustain as a community necessarily, but it is an important aspect of not only talking about digital learning in the classroom, but modelling this learning. 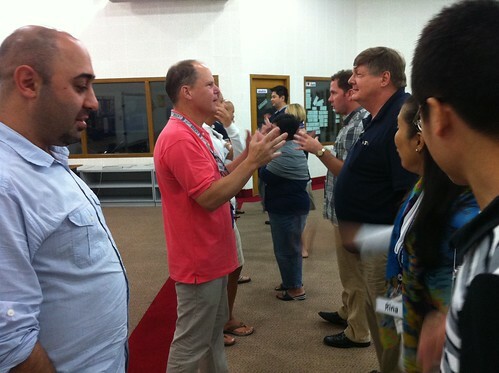 What is also very important is that participants can readily find the workshop material after the event, and in fact can find each other via their presence on both the Ning and the wiki, both of which it is my responsibility to make sure are there and not taken down in the near future. See all the fun of the workshop on Flickr. Find out more from my portfolio, Learning Confluence, re professional development opportunities that can be brought to your school.